Fig. 1. Thomas Lindsay Elder photo circa 1900 when "Elder the roaring lion" first enters the coin arena. 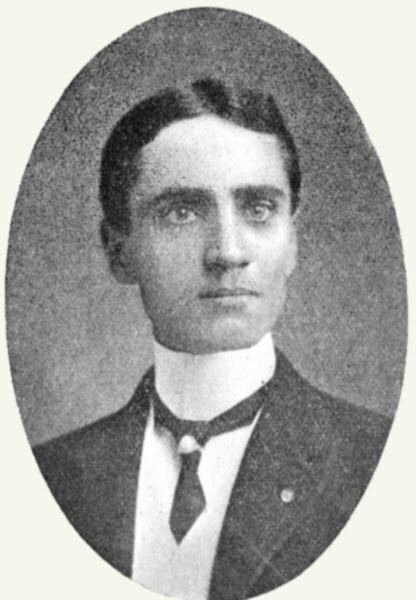 Another photo taken at this time favoring the left rather than the right angle shown above was published in The Yearbook (1902) American Society of Curio Collectors, page 8. McLeod Mason Elder (1849-1924) and Hannah Knox Elder (1851-1921). McLeod Mason Elder (1849-1924) photograph circa 1878.
when other prominent dealers like B. Max Mehl, Wayte Raymond, Joe and Morty Stack, emerged dominating the market overshadowing him. used to pick around refuse heaps for these and I well remember there was a sort of standard cash price for them, six or eight for a cent among the boy collectors of eight or nine years each." He studied at Park Institute and Beaver College. On May 20, 1896 he joined the Sons of the American Revolution having been descended from Robert Elder. French coins. A similar but larger size ad appeared in the January 1900 issue on page 33.
a mailing address at Princeton Place, Pittsburgh, Pennsylvania, most probably his residence and daily commuted back and forth by train. include the myriad of other curiosities and collectibles. Philatelic West. The December 1901 ad in The Numismatist changed adding paper money and broken bank bills, listing Colonials pieces with prices. Palmetto "No submission" token. 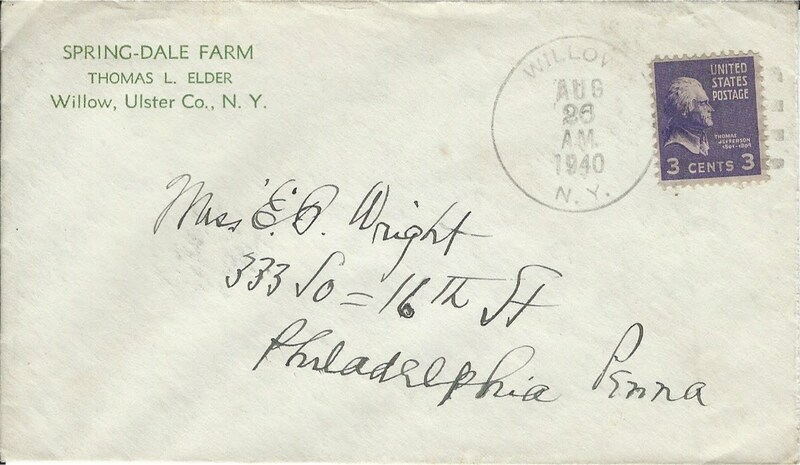 B. P. Wright replied in the April issue correcting him about the attribution, and also about the Pitt medal. He ran a whole page ad in the April 1901 issue of Philatelic West, 4th leaf recto from the back. His name was misspelled in that ad as UHOMAS L. ELDER. 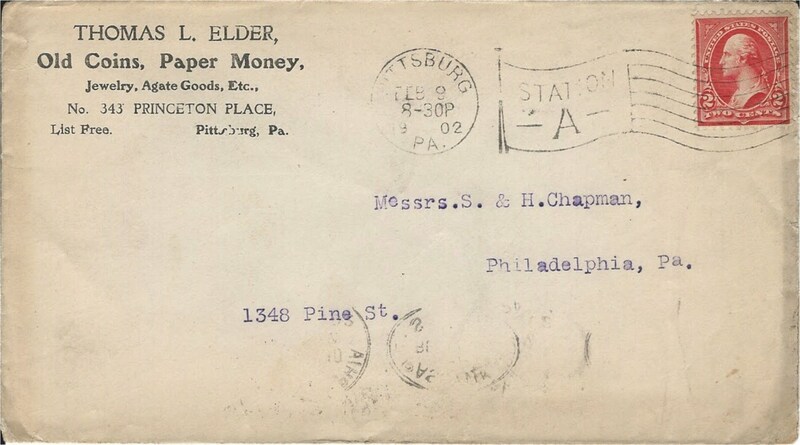 Pennsylvania, Station A. He advertises selling Old Coins, Paper Money, Jewelry, Agate Goods, Etc., with his address at 344 Princeton Place, Pittsburgh, Pennsylvania. on capital letter "M" and small "e". Gem Stones, Curios, Etc. 238 Sheridan Ave., Pittsburg, Pa. Price List Free. 6th during the Pan American Exposition at Buffalo, New York. In the September issue 1902 of Philatelic West he published a full page advertisement and an article, "The Popularity of the Large U. S. Cent". W. Adams, United States Numismatic Literature, Vol. 2, pages 25-49.
met with President Theodore Roosevelt. Fig. 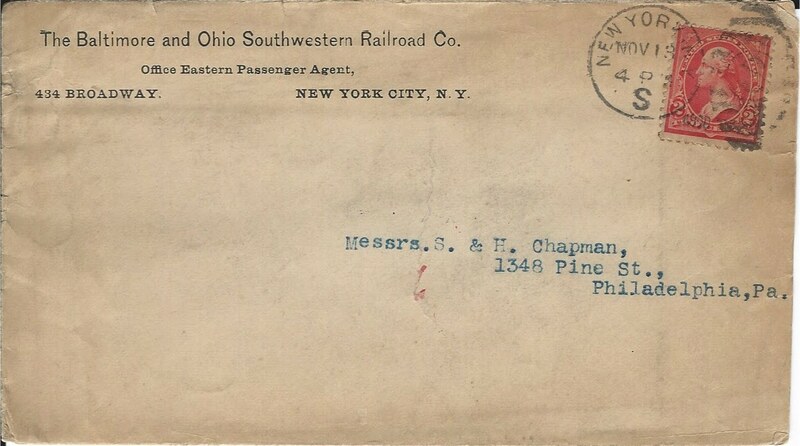 Thomas L. Elder correspondence with the Chapman Brothers with his hand-stamped in blue ink corner card postmarked January 2, 1905, 8:30 PM, machine cancel. postcard see the biography of Farran Zerbe. (Tarentum) bearing Herakles (Hercules) wrestling the Nemean lion, postmarked April 8, 1906, 3 PM, duplex cancel. Courtesy Lupia Numismatic Library, Special Collection, The Chapman Family Correspondence Archive. In 1906 he began publishing in March, The Elder Monthly, Devoted to Things Numismatic, Archaeologic, Philatelic, Historic, Antique, &c., a monthly magazine. Coin Review (Winter 1988) : 59-62; Pete Smith aptly called him "Opinionated and Outspoken" in The Numismatist (2000) : 399-400; and innocently John W.
The New Rare Coin Book (1934). by The Elder Coin & Curio Corporation, he asserted, though without evidence, that he had established his coin dealership in 1896, when he was twenty-two years old. important sales of the era." Dave Bowers, Coins and Collectors, 2d ed., page 143. Pennsylvania. They were divorced in 1910. She kept the name Elder until 1930. She worked as a maid. merely as the manager probably to avoid lawsuits and alimony to his former wife. That only lasted until his father's death in 1924. Avenue. These were all die-hard numismatists and collectors each one a notable figure critical to 20th century American numismatic history. In 1909, he edited and published Ebenezer Gilbert, United States Cents of 1796. This was a first of three volumes in which Elder assisted the aged Gilbert. failure especially during the 1909 ANA presidential election. This set Elder off on a rampage. From here on in Tom's mind everyone is guilty until proven innocent! IMPUDENCE" and "IN ME I TRUST." 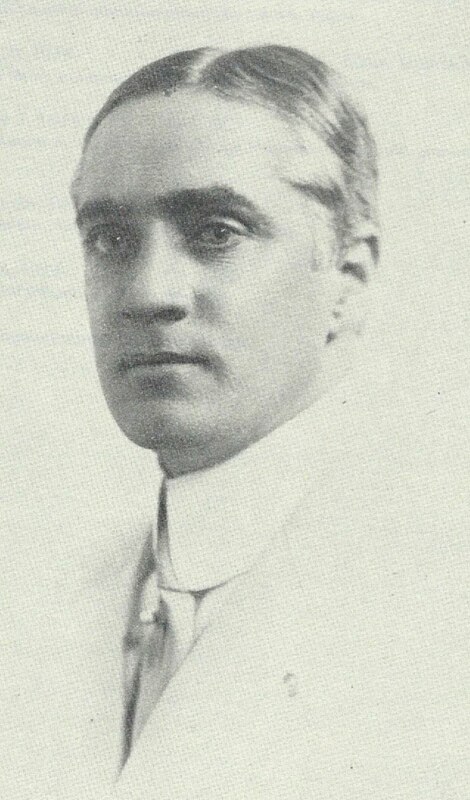 Hubbard (1856-1915). From 1910 to 1911 he published The Elder Magazine. which was also issued as part of the 1909 Hudson-Fulton celebration in New York City. Elder issued the "Dedicated to Coin Collectors of Canada," DeLorey 84. It is believed that less than 50 pieces were struck in silver and the newly released Hibler-Kappen reference suggests that less then 20 are believed extant. a deadbeat," as the victim entered the room and all heads turned." Coins and Collectors, 2d ed., page 149. In 1910 he edited and published Ebenezer Gilbert, United States Cents of 1794. This was a second of three volumes in which Elder assisted Gilbert. His 1911 passport application lists his occupation as an antique dealer. He was 36 years old, 6'-3/4" in height, with blue-gray eyes, and had iron-gray hair . Exposition "Theodore Roosevelt Medal" (lot number 308). Recall that he would not write to Zerbe ordering any of these, but rather, wrote to the Chapman Brothers. the dime, quarter and half dollars, but this claim may very well be an exaggeration. In 1916 he edited and published the very aged Ebenezer Gilbert's, United States Half Cents. This was the third of three volumes in which Elder assisted Gilbert. He co-catalogued 1197 lots of coins for an Anderson auction held February 4, 1916, together with Wayte Raymond. article on the subject "Collecting--With Special References to Coins, Medals and Paper Money," The Numismatist, Vol. XXIX, No. 12, December (1916) : 529-42. The then, 42 year old veteran collector and dealer cited French poets and other literati to express the art historical aspects of collecting in its character. of Ward, Jewett, Toupal. 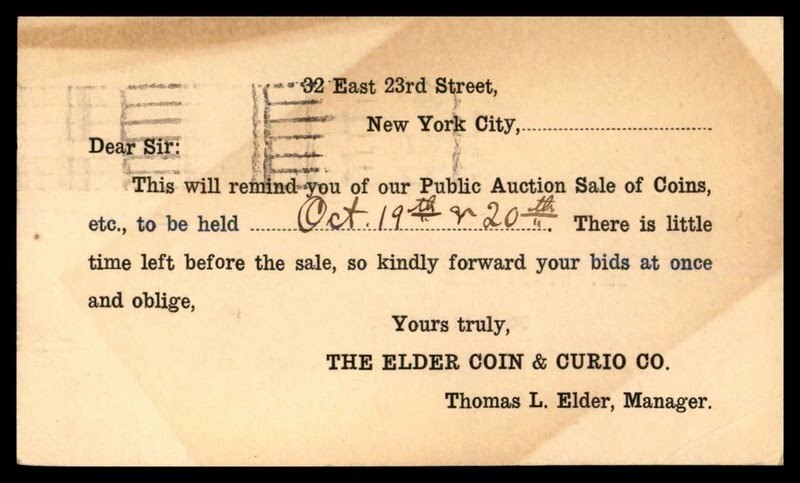 Courtesy the Lupia Numismatic Library, Thomas Elder file. the soldier and to the selected man who has been called, or expects to be called, to military service (1918). especially the rare gold coin collection. This was first noted by John W. Adams in U. S. Numismatic Literature, Vol. 2. 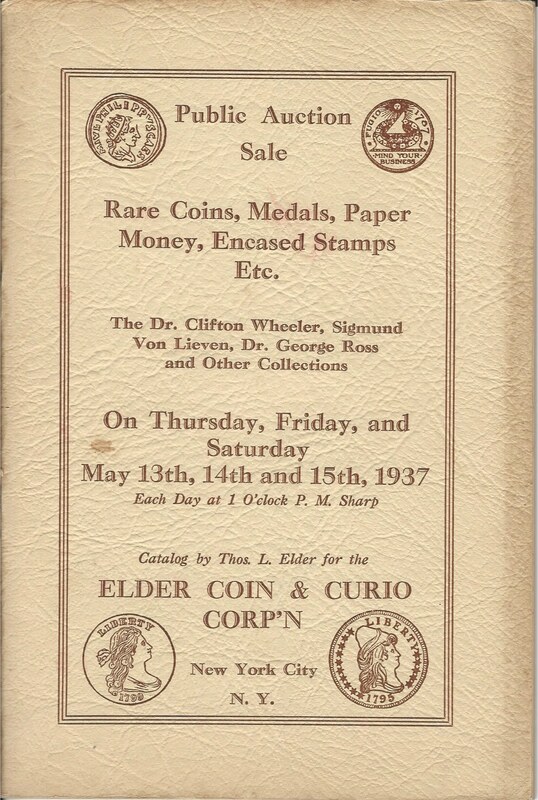 He advertised "The Elder Coin & Curio" in The New York Tribune in December 1919. Fig. 6. Pugnacious Thomas L. Elder photo c. 1920's, during his final disgruntled decade fighting to be on top. Collectors, 2d ed., page 151. Fig. 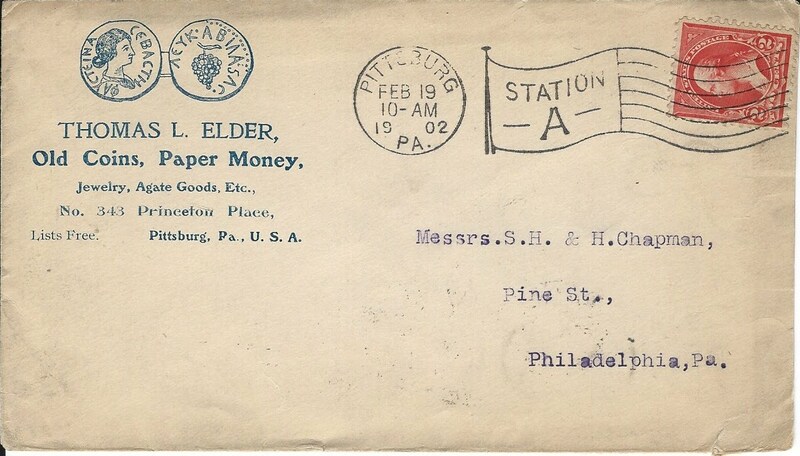 Elder circular for coin auction sale postmarked August 23, 1921. Courtesy Lupia numismatic library, Special Collection, Thomas L. Elder. The Chapman Family Correspondence Archive. Charleston Library Society. Attending the 179th Annual Meeting on January 17, 1928, he is reported as a donor of books and pamphlets. tourist, and advisor and consultant. supported him as he sank into oblivion. Henry Chapman bid $7,900 on the Massachusetts & California Co. 1849 $5 gold piece, and $7,000 for the Wass Molitor & Co. large head 1855 $20 gold piece. the company. But there were no takers and he was forced to close. (No. 282) with eleven more to follow ending with the last Thomas Elder sale on May 25, 1940. Courtesy the Lupia Numismatic Library, Thomas Elder file. ending in nothing happening but shutting down Elder Coin & Curio Corporation. A TOKEN in center, ringed by stars and with a bowed wreath design around the rim, which was issued for the 1939 New York World's Fair by coin dealer Thomas L.
Elder, 100 pieces struck with a matte finish. New York. By August 1940 he moved to Spring-Dale Farm, Willow, Ulster County, New York. Fig. 8. 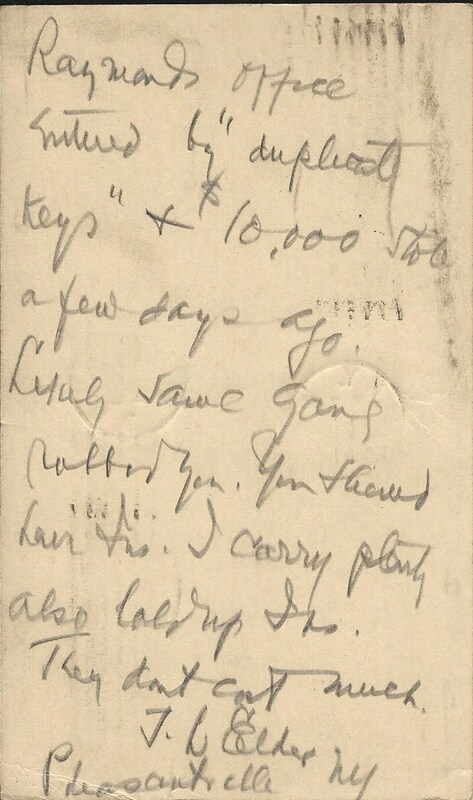 Thomas Elder writing to Ella B. Wright, Manager of Henry Chapman, Numismatist, Inc., postdated August 26, 1940, Willow, New York, buying $20.99 in coins. Collection, The Chapman Family Correspondence Archive. Numismatist, April (1948) : 287.
at Wayte Raymond's office of $10,000. Soon afterwards Elder returned home to Greenville, South Carolina. Courtesy the Lupia Numismatic Library, Special Collection, The Chapman Family Correspondence Archive. notice. He is buried in Kittanning Cemetery, Armstrong County, Pennsylvania. He was survived by his wife Ruth (d.1954). They had no children. contributions." U.S. Numismatic Literature, Vol. 2, page 25.
years after the birth of Ethel. Seitz was related to Elder through his mother Lydia May Seitz (1887-1937), and was not his son-in-law. 001. March 5, 1903, 768 lots. Smart, Moody, et al. Mail bid. 002. September 30, 1905, 852 lots. Catalogue of the first public auction sale of coins, medals, and paper money. 010. February 20, 1907, 900 lots. Selee, Clark, Anders, et al. 011. May 6, 1907, 882 lots. Anders, Dow, Devere, et al. 012. May 23, 1907, 911 lots. George Anders et al. 014. October 14-15, 1907, 1992 lots. CATALOGUE OF THE THIRTEENTH PUBLIC AUCTION SALE OF COINS, WAR MEDALS, JACKSON TOKENS, PAPER MONEY, FOREIGN AND UNITED STATES GOLD, ETC. THE PROPERTIES OF J. N. T. LEVICK, MRS. MINNIE HIRSCH, E. S. SELEE AND OTHERS. TO BE SOLD AT THE ELDER AUCTION ROOMS THIRTY-TWO EAST TWENTY-THIRD STREET, NEW YORK CITY. DANIEL R. KENNEDY AUCTIONEER. ON MONDAY AND TUESDAY EVENINGS, OCT. 14 AND 15, 1907, BEGINNING EACH EVENING AT 7 O'CLOCK. 015. December 19, 1907, 1396 lots. Estate J. Chase, et al. 016. 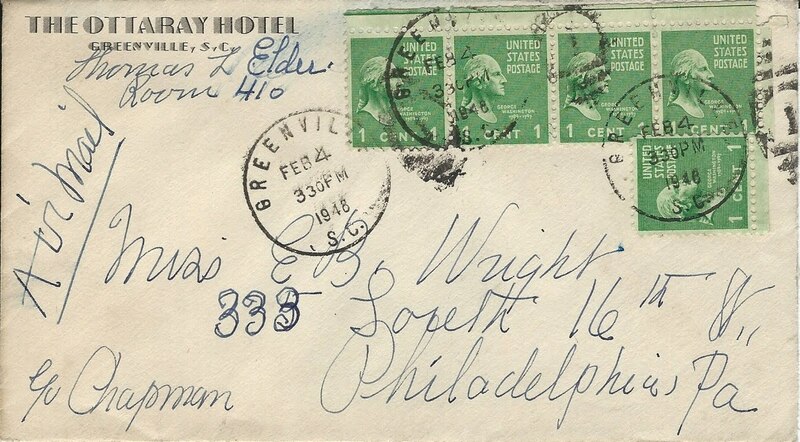 February 26-27, 1908, 1477 lots, Greenbough, Levick, Emery et al. 019. June 15-16, 1908, 1136 lots. Peter Gschwend. 020. September 26, 1908, 809 lots. Catalogue of the Nineteenth Coin Sale. 021. October 5-7, 1908, 1409 lots. James B. Wilson. 022. October 17, 1908, 907 lots. Belknap, Martin, et al. 023. December 17, 1908, 1027 lots. Catalogue of the Twenty-Second Coin Sale. 024. January 16, 1909, 616 lots. Rev. F. M. Bristol, et al. 025. February 16, 1909, 850 lots, Linklater, Raridon, et al. 026. February 25, 1909, 523 lots. Linklater, et al. 027. March 12, 1909, 700 lots. Catalogue of the Twenty-Sixth Coin Sale. 028. April 5, 1909, 710 lots, Frank W Doughty, et al. 029. April 9, 1909, 687 lots, Frank W Doughty, et al. 030. April 30, 1909, 466 lots. Frank W Doughty,Part III. 290. May 14, 1938, 1389 lots. Edward Rausch. 291. September 7, 1938, 1531 lots. Dr. Clifton Wheeler, R. M. Norton, et al. 292. May 12, 1939, 1546 lots. Norton, Revere, Lett, et al. 293. May 25, 1940, 1700 lots. Walter D. McCaw, G. C. Markley. Elder, T. L., Remarkable Collection of Greek Tetradrachms. Three Hundred Silver Coins of Alexander the Great. Unearthed During the Spring of 1908, at Demanhur, near Alexandria, Egypt. (New York, no date). The Numismatist, September 1899; Vol. XV, No. 1, January (1902): 32 (advertisement); No. 3, March (1902) : 96 [advertisement]; No. 4 April (1902) : 121, 123 (ad); Vol. XXII, No. 5, May (1909) : 148, 156 (ad); No. 6, June (1902) : 187; No. 7, July (1902) : 205, 209, 220 (ad); No. 8, August (1902) : 254; No. 9, September (1902) : 284; Vol. XVIII, No. 3 March (1905) : 101 ½ page ad rare colonials. Pittsburgh Press, Tuesday, July 12, 1921, page 16 obit of Mrs. Elder. Hobbies : The Magazine for Collectors, December (1934) : inside front cover full-page ad. Thomas DeLorey, "Thomas L. Elder : A Catalogue of His Tokens and Medals," The Numismatist, Vol. 93, (1980) : 1328-51; 1608-30. David Stone, "The Rare Plated Woodin Catalogue : Tom Elder's Epic Gold Sale," The Asylum, Vol. 33, No. 2 April-June, (2015) : 38-50.